In the opening hours of the Battle of the Philippine Sea, an American Patrol Plane as unable to transmit the location of the Japanese fleet. A great deal has been written about the battle for Saipan, including the Battle of the Philippine Sea, remembered today as having included “The Great Marianas Turkey Shoot.” However, certain events that could have turned the battle in any number of directions are often mentioned only in passing. 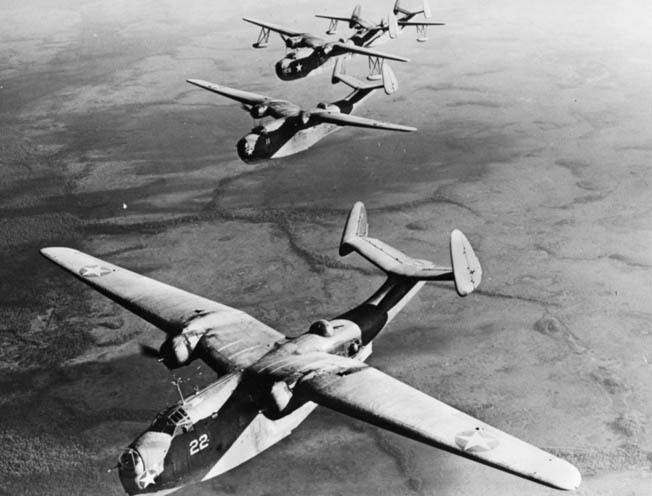 One of these events is the role played by one Martin PBM-3D Mariner aircraft of Navy Patrol Squadron 16 (VP-16) in locating the Japanese fleet as it sailed east for what both sides hoped might be a decisive naval battle. Admiral Raymond Spruance, in overall command of Operation Forager, the campaign for the capture of the Mariana and Palau island groups, was receiving reports from American submarines as to the movement of Japanese ships under Admiral Jizaburo Ozawa that were heading in the direction of the Marianas. However, Spruance’s carrier-based planes under Admiral Marc Mitscher of Task Force 58 had limited range and little luck in pinpointing the exact location of the Japanese ships. Likewise, Spruance, always the cautious warrior trying to think like his Japanese opponent, was concerned that Ozawa might try to draw him west while splitting his force to do an end-around and attack the U.S. transports off Saipan. That is when he ordered a number of available PBM-3D flying boats up from the Marshall Islands. His hope was that with their longer range they might locate the Japanese fleet and thus help him make his decision as to how best to meet the coming threat. By the summer of 1944, the United States and its allies were no longer just holding the line but pushing back on all fronts. The Russians were advancing west and closing in on the German homeland. In the Southwest Pacific, General Douglas MacArthur had advanced along the north coast of Papua New Guinea and, in late May of that year, made landings on the island of Biak as part of the final effort to return to the Philippines. A week later, on June 6, Allied forces under General Dwight D. Eisenhower began the liberation of Western Europe with landings in Normandy. As the Japanese were putting together a relief mission to stop MacArthur at Biak, Admiral Chester W. Nimitz, Commander-in-Chief Pacific Ocean Areas, gave them a right hook with Operation Forager. With the exception of Guam, the Japanese had been in control of the Marianas since 1914 during World War I, when they simply sailed in and seized the islands of German Micronesia without firing a shot. Thirty years later they would have to give up those islands, but the process would be anything but bloodless. On Saipan alone, the Japanese would lose more than 40,000 of their nationals, including civilians. The Americans suffered roughly 15,000 casualties, almost a third of them killed in action. For almost 300 years the Philippines and the islands of Micronesia had been Spanish colonial possessions. This all changed in 1898 with the war between Spain and the United States that resulted in Spain giving up the Philippines and also the island of Guam in the Marianas. Guam was taken because it was needed as a coaling station for U.S. ships sailing to the newly acquired colonial possessions in the Philippines. A year later, Spain, in need of capital, sold the rest of Spanish Micronesia to Germany. Germany’s interest in the islands was economic but short lived, being forced out by the Japanese just 15 years later. With America’s entry into World War II following the Japanese bombing of Pearl Harbor, Guam, just a few miles south of Japanese-held Saipan, fell within hours to a superior Japanese force and would not be liberated until July 1944, a month after Saipan had been secured. Although American offensive operations in the Central Pacific got off to a rather late start compared to other theaters, once they got going with landings in the Gilbert Islands there was no slowing them down. Soon the Marshall Islands fell at minimal cost compared to the bloody three days required to take Tarawa in the Gilbert Islands. As a result of these successes, Admiral Nimitz felt comfortable in advancing the date for operations in the Marianas, which both the Japanese and Americans knew would put the Allies within striking distance of the Japanese home islands. More than 500 ships—most sailing from Hawaii—and more than 127,000 men were involved in the operation to wrest Saipan, an island only 15 miles long and eight miles wide at its widest point, from the Japanese. War came to the Japanese on Saipan when U.S. carrier planes struck in February 1944. The enemy garrison then had just over three months to prepare for a tsunami of fire and steel that would soon turn this tropical paradise into a broken and burned wasteland. In the months before U.S. Marine and Army forces assaulted Saipan, the Japanese were moving to evacuate some of the thousands of civilians living on the island. At the same time they were attempting to bring in more military personnel and equipment to fend off what was obviously going to be an attempt to break what the Japanese considered their outer ring of defense in the Pacific. However, by this point in the war U.S. submarines and aircraft dominated the waters and skies throughout most of the Pacific. As a result, most of the ships evacuating civilians, while at the same time attempting to reinforce island garrisons, were being sunk in record numbers. Heavy carrier air strikes against Saipan began several days before the American landings on June 15 and continued throughout the campaign. 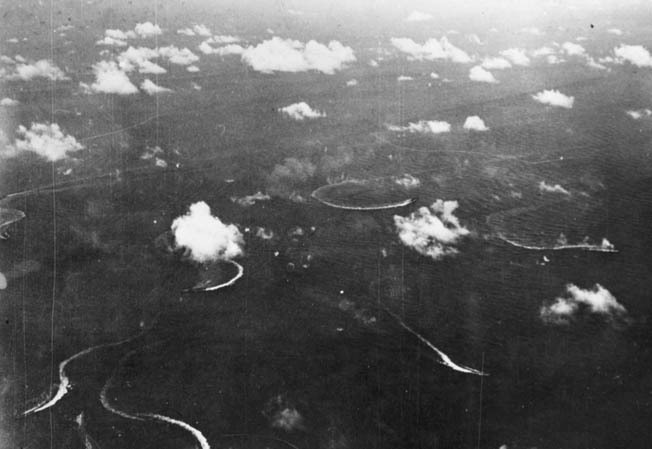 Likewise, to prevent Japanese land-based planes from disrupting the landings, planes from Mitscher’s fast carriers attacked island airfields on nearby Guam and Rota, and also those farther to the north in the Bonin and Volcano Islands. Meanwhile, Spruance, in overall command of Operation Forager, started receiving reports of the Japanese fleet movements. The first report came from the submarine USS Bowfin. Even before the landings started, Bowfin reported a large number of Japanese ships off the northeast tip of Borneo. This was followed by another report from the submarine USS Flying Fish, this time of a Japanese fleet that included aircraft carriers exiting San Bernardino Strait in the Philippines. 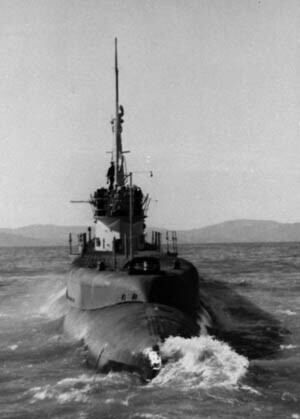 Later, the submarine USS Sea Horse reported another group of Japanese ships approaching from the west and slightly south of Spruance’s Fifth Fleet. These reports and Spruance’s own contemplation led him to believe that the main Japanese objective was to disrupt the landings on Saipan by drawing the Fifth Fleet west, allowing Ozawa to split his forces and attack the U.S. transports under Admiral Richmond Kelly Turner, which were off the coast of the Marianas. Mitscher, on the other hand, saw the Japanese move as an opportunity for a decisive fleet engagement that had the potential of putting the Imperial Japanese Navy out of the war completely. However, Spruance’s caution and focus on protecting the landings prevented Mitscher from doing what he wanted. Instead, Spruance ordered him to sail west during the day and east during the night to protect the transports still offloading men and supplies in a battle that was not going as smoothly as hoped. Mitscher was sending out carrier aircraft to try and locate Ozawa’s fleet. However, given the limited range of U.S. carrier aircraft and the vastness of the seas west of the Marianas, he was not having any success, prompting Spruance to order up from the Marshall Islands the available PBM-3Ds of Navy Patrol Squadron 16. Patrol Squadron 16 was formed in December 1943 at Harvey Point, North Carolina. The PBM-3D Martin Mariner was a larger but less reliable cousin to the Consolidated PBY Catalina that was first developed in the early 1930s. The PBMs, unlike the PBYs, did not become operational until the early 1940s and suffered a number of problems common to a new type of aircraft. Besides design and structural issues, the underpowered Wright R-2600-22 engines were a source of constant worry to those who flew in the Mariner. Engine failures were common, and few PBMs could boast making it back to base on just one. The failure of both often resulted in the loss of all aboard. The one thing the Catalina and the Mariner had in common, however, was that they were both slow, with maximum speeds of around 200 miles per hour and a normal cruising speed of well under that. Put another way, they were both meat on the table for any fighter plane of that era. William Sheehan was born in Oakland, California, in 1922. He wanted to enlist in the U.S. Navy right out of high school, but his mother would not sign for him until after he received his draft notice. Thinking he was better off in the Navy than in the Army, his mother readily signed on the dotted line. In October 1943, he entered the Navy and was sent to boot camp in Farragut, Idaho, probably not an ideal location for a California boy not used to cold winters. After boot camp, Sheehan was sent to aviation mechanics school in Norman, Oklahoma, and from there to PBM School in Banana River, Florida, now better known as Cape Canaveral. He then joined VP-16 in North Carolina. The squadron’s commanding officer was Lieutenant William Scarpino, and the executive officer was Lieutenant Ralph John. Sheehan’s patrol plane commander was Lieutenant K.O. Hotvedt. The bureau number of the PBM-3D nicknamed Boomerang that Sheehan would fly in for the duration of the war was 48198, a number that Sheehan remembered for more than 50 years. After a brief period of training out of Naval Air Station Key West, Florida, VP-16 received orders in April 1944 to Naval Air Station Alameda in California for deployment to the South Pacific. From Harvey Point, North Carolina, the squadron flew to Eagle Mountain, Texas, before setting off the following day for San Diego. On the way, Lieutenant John’s PBM-3D lost an engine. In spite of every effort to stay in the air on the one remaining engine, within five minutes the plane crashed with the loss of all aboard. This would not be the last time VP-16 had to either abort a flight or a plane was lost because of engine failure. On the way to Hawaii from California in May, Lieutenant R.W. Briggs and his crew had to ditch and spent almost two days in rubber life rafts before being rescued. From Hawaii, VP-16 flew to the Marshall Islands via Palmyra Island and Canton Island, where airfields had been built before the war in anticipation of their use in case of conflict with Japan. When the first five PBMs arrived in the waters off Saipan late on June 17, 1944, the men were based aboard the destroyer USS Ballard but later transferred to seaplane tender USS Pokomoke (AV-9). Almost immediately upon arrival they were sent out on patrol. In the early morning hours of June 19, Lieutenant Arle, flying one of the PBMs, made radar contact with 40 ships 470 miles west of Guam. However, the radio operator aboard the PBM, Chief Petty Officer Tibbets, could not make radio contact with the Fifth Fleet. He said he had a problem with what was called “skip distance,” bouncing the message off the ionosphere. It was picked up in places such as Pearl Harbor and even Washington, D.C., but not by the ships off Saipan. Those who did receive the message did not forward it to Spruance. Had they done so, the history of the Battle of the Philippine Sea might well have been different. In desperation to get the news to Spruance, the message was then sent “in the clear.” Still, it was not received. As a result, Arle immediately headed back to Saipan to deliver the news in person. However, that was more than a seven-hour flight, and by that time it was too late. As a result of not receiving this information in a timely fashion, Spruance launched his fighters late, not to attack the Japanese fleet as Mitscher had hoped, but to engage carrier aircraft launched by Ozawa before they could do any damage to the ships of the Fifth Fleet. Because of the inability to radio the contact with the Japanese fleet in a timely manner, the Americans had lost an opportunity to inflict an even greater defeat on the Japanese. It is possible that the enemy fleet might have been annihilated along with the many enemy planes that were shot down. 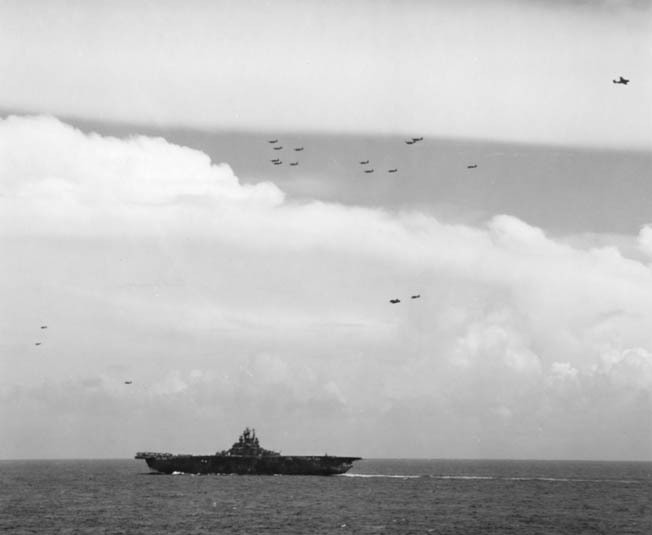 When the initial Japanese airstrike of the Battle of the Philippine Sea approached Task Force 58, most of the attacking planes were shot down by U.S. carrier-based Grumman F6F Hellcats or the massive antiaircraft fire thrown up by Fifth Fleet’s escorting ships. The few Japanese planes to survive the ordeal either headed back to their carriers or fled to one of the Japanese-held islands in the Marianas. Even then, there were patrolling Hellcats waiting to do them no good when they attempted to land. One Japanese pilot landed on Saipan after the main airfield had fallen into American hands. His fighter was shot to pieces as he landed, but the pilot somehow managed to walk away from his wrecked plane without injury. When asked why he landed on Saipan, he said he was told that the island was still in Japanese hands. He was one of the few Japanese airmen to survive the battle. Was Spruance’s Cautionary Approach Correct? Admiral Spruance was criticized by some for his cautionary approach to the battle that allowed Ozawa to escape with most of his fleet intact, just as some had criticized him after the Battle of Midway in June 1942, for not chasing the Japanese after they had lost four aircraft carriers. However, as any number of Pacific War historians have pointed out, regardless of the caution that Spruance displayed both at Midway and the Battle of the Philippine Sea, both were one-sided victories for the Americans. In October 1944 during the Battle of Leyte Gulf, Admiral Spruance’s good friend Admiral William F. “Bull” Halsey, mindful of the criticism leveled at Spruance for being overly cautious at both Midway and Saipan, did just the opposite and suffered criticism of his own. Upon General MacArthur’s return to the Philippines with landings on the east coast of the island of Leyte, Halsey was lured away from the San Bernardino Strait to the north. Ozawa, who had lost most of his planes in combat earlier in the year, was used along with his now nearly empty carriers to lure Halsey away from his guard duties. Halsey took the bait, and as a result Vice Admiral Takeo Kurita, with his force of battleships and cruisers, came within a breath of wiping out the landings on Leyte. Guarding those landing beaches was something Spruance felt was his priority earlier in the year at Saipan, yet he was criticized for being too cautious. VP-16 had other problems besides not being able to report the position of Ozawa’s fleet. One of its planes became a casualty of the air battle, but not as a result of enemy fire. On the contrary, one of VP-16’s PBMs returning from a patrol was mistaken for a Japanese Kawanishi flying boat by a group of F6F Hellcats and was attacked. Before the offending pilots had realized their mistake, one of the crew, Gilbert Person, was dead. Then on June 22, another PBM, this one piloted by Lieutenant Harry R. Flashbarth, was shot down while on a night patrol by a destroyer of Task Force 58. There were no survivors. After most of the excitement was over, Sheehan and the crew of Boomerang finally arrived off Saipan on June 24, having been forced to wait in the Marshalls to have a damaged propeller replaced. Sheehan noted that at this time it was not unusual to see bodies floating in the water off the coast. If the bodies were Japanese, they were left alone. If they were American bodies they were retrieved for possible identification and a proper burial. One Marine that Sheehan met during his few days ashore on Saipan was Frank Zark. They became friends of sorts, even though Sheehan admitted to never seeing or hearing from Zark again after that. He remembers Zark for two reasons. Zark told him about how he had stopped a Japanese tank with his bazooka earlier in the fighting. He also remembers Zark because he said he could not sleep at night out of fear that a Japanese soldier would sneak into his foxhole and slit his throat. On August 1, 1944, VP-16 was relieved by VP-18. VP-16 then regrouped at Ebeye Island in the Marshalls for engine overhaul and replacement and other much-needed maintenance. On August 21, the squadron was sent to Kossol Passage in the Palaus west of the Marianas. The crews conducted routine patrols until late November 1944, when they were ordered home. The pilots flew from the Palaus back to Hawaii and eventually to Alameda. However, they again were plagued by engine problems. Boomerang, with Lieutenant Hotvedt still at the controls, made three attempts to get home. The first two attempts resulted in turnarounds to Kaneohe Naval Air Station in Hawaii because of engine problems. When Boomerang was finally nursed home the plane was scrapped. Sheehan spent the rest of World War II at Alameda and was discharged in November 1945. If remembered at all, VP-16 is probably recalled as just one of many seaplane squadrons that served in the Pacific in various roles. The fact that one of its PBM-3Ds spotted Admiral Ozawa’s Japanese carrier force in the opening moments of the Battle of the Philippine Sea, well in advance of its last minute location by Fifth Fleet radar, is mentioned only in passing in most histories of the Marianas campaign. The incident remains one of many what-ifs of the Pacific War. Tags Admiral Chester A. Nimitz, Admiral William "Bull" Halsey, Aircraft carrier, Battle of Leyte Gulf, Battle of Midway, Battle of the Philippine Sea, General Douglas MacArthur, Gilbert Islands, great marianas turkey shoot, Japan, marc mitscher, New Guinea, Pacific War, Papua New Guinea, Raymond Ames Spruance, Richmond Kelly Turner, South Pacific, USS Bowfin.